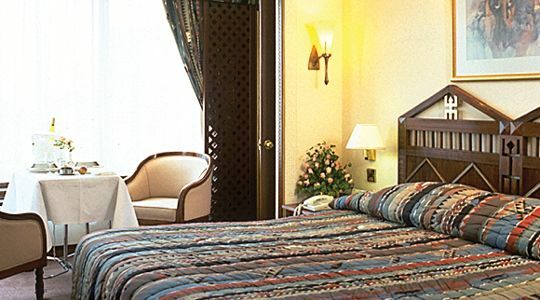 Justly famed for its superlative standards of efficiency, service and hospitality, the elegantly sophisticated Nairobi Serena Hotel is a member of the Leading Hotels of the World and the proud flagship of the Serena Hotels’ fleet of world-class hotels. 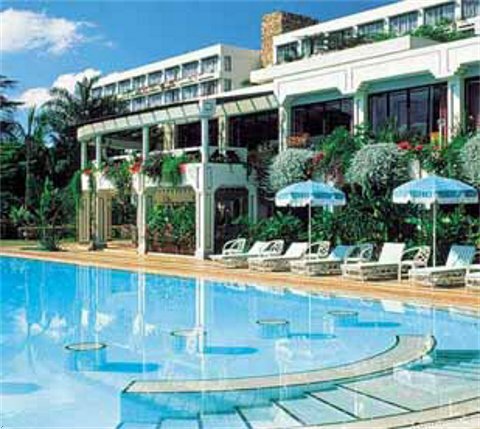 Considered by many to be Nairobi’s finest hotel, the Serena stands amidst lush tropical gardens with panoramic views over Nairobi’s Central Park and the glittering downtown skyline. 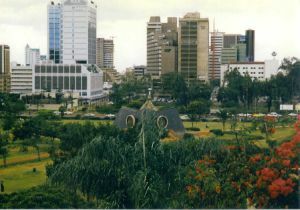 Despite its pivotal central location, the Serena also remains true to its title and offers an oasis of serenity amidst the bustle of one of Africa’s most vibrant capital cities.Established in the mid-1970s, The Serena Group was launched with a simple but challenging goal; to become the leading hotel group in East Africa. Today this goal has become a reality. 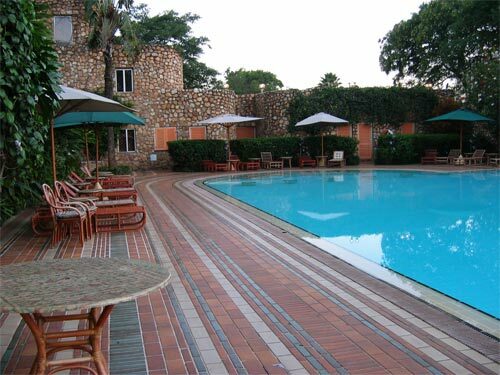 Set amongst the lush-green abundance of extensive tropical gardens, looking out over the gentle green avenues of Central Park and commanding a panoramic view over the glittering towers of downtown Nairobi, the Serena Hotel enjoys one of the finest locations in the city. Sensitively constructed from ecologically sympathetic materials, the interior décor of the hotel reflects a kaleidoscope of cultural influences blending Moroccan mystique and a breadth of African heritage into one elegant and harmonious whole. All the comforts of home... Serenely elegant, essentially African and superbly equipped, the Nairobi Serena has the ultimate in room choices. All are appointed to the highest international standards and have been individually interior designed along pan-African themes. Relaxed and informal Moroccan-styled all-day café, takes its inspiration from the Swahili word Maghreb meaning “west of the setting sun”, features a vibrant décor that reflects the jewel-hued stalls and bright-polished coffee pots of the Kasbah. As for the menu, it is international in style, reflects the best of eastern and western cuisine and features a globetrotting selection of themed menus throughout the week. It also allows for al fresco dining with views over the shimmering waters of the pool. Taking the ancient Ethiopian town of Aksum as its mystical muse, this spacious and innovatively designed bar opens onto lush gardens where evening cocktails and Sunday brunch are served. The décor blends brilliantly eclectic Ethiopian wall hangings, fascinating ethnic crafts and a whimsical umbrella-hung ceiling with the calm modern-day sophistication of a world-class hotel. As well as a broad range of international labels, fine wines and fresh juices, the Aksum Bar also offers a world-class cocktail line-up. For a more relaxed, sun and sky ambiance why not try our al fresco Pool Bar, which offers all the cool of an oasis, in the heart of the city. Looking out over the shimmering blue waters of our heated pool, shaded by the rustling palms of our tropical gardens the Pool Bar décor suggests the brilliant white arches, sparkling mosaics and fountained courts of a sultan’s palace. As for the menu, it features an all-day selection of hot and cold snacks, ice cream sundaes, mid-morning pastries and spicy evening appetisers whilst the drinks line-up includes an international cocktail selection, a range of fine wines and spirits, Italian-style coffee, herbal teas and a broad selection of fruit cocktails and chilled juices. Named after the Bambara tribe of Mali and decorated to a West African theme that majors on hand-carved Camphor wood panels, each depicting an African legend, the Bambara Lounge offers 24 hour service to resident hotel guests only. Exceptional ambiance, exquisite cuisine. The uniquely situated ‘Mandhari’ restaurant enjoys panoramic views over the bright lights of the city and the gentle green lawns of Nairobi Central Park. It also offers an open-air dining terrace overlooking the pool, a frescoed dining room, gentle piano music and impeccable service. Famous for the delicacy of its cuisine naturelle the ‘Mandhari’ menu choices include; Indian Ocean seafood, wild game, fresh-caught river fish and some inspirational oriental, vegetarian and Swahili dishes. Lapis blue water shimmers over Moroccan mosaic while a loggia-shaded terrace tumbles wax-green creepers and trumpet blooms. Blurred outlines of trees suggest meandering park paths and beyond both rise the lilac-grey skyscrapers of down town dusk. You could be anywhere. But if you had to make the choice – it probably wouldn’t be the centre of Nairobi. Yet this is the terrace of the first-floor Mandhari Restaurant, the finest of the Serena Hotel Group’s restaurant line-up and the flagship of her culinary fleet. Here you can dine al fresco and by candlelight, whilst watching necklaces of headlamps thread the city’s arteries, lights switching off floor-by-floor in glittering office towers, and searchlight beams from incoming jets piercing the skies over Jomo Kenyatta International Airport. Inside the Mandhari Restaurant it’s a different landscape altogether. 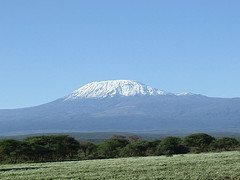 As you might expect given that the name means ‘landscape’ in Swahili. Here the entire length of one wall is taken up by a hand-carved fresco in all the soft coffee, cream and rose pinks of Kisii soapstone. It actually depicts the knuckle-dent outline and wooded slopes of Nairobi’s famous Ngong Hills but it could just as easily be a medieval frieze in a Tuscan monastery. Elsewhere there’s a draped and mirrored Bedouin tent for the intimacy of private dining and a wall of windows onto the balmy darkness of a Nairobi night. The effect, with candle glow lighting, lavish draped tables, stiff starched napery and the lush tinkle of a grand piano is civilised, chic and encouraging. The menu should make good reading. Which it does, being both international eclectic and essentially Kenyan. Choices include, for starters, Carpaccio of Ostrich, Escargots Ravioli Tossed in Truffle Oil, Fettuccine in a Gorgonzola Sauce and Crab Chowder with Lemon Grass. The entrée choices are even harder to make and range from Saddle of Gazelle with Poached Pears to Fillet of Pork Coated in Chestnuts and served with a Tamarillo Sauce, with all manner of ingenious vegetarian options in between. As for the seafood, choose from Black Bass Baked with a Lemon Soufflé, a bewildering selection of seafood, lobster and big-game fish choices and some simple but luscious Jumbo Prawns that come sautéed in garlic and butter alongside a mound of aromatic rice with a side dish of al dente vegetables and fresh-cooked local spinach. ‘All that glitters is not gold’ when it comes to descriptive menus? True, but the Mandhari delivers on its promise and the ingredients are allowed to speak for themselves, being neither hidden behind sauce nor over presented in glaze, gratinée and garnish. As for the wines, the selection is slick and the service light-handed. And, in the unlikely event that you have any appetite left after sampling the best of the above there is also a daunting dessert trolley laden with chocolate seductions, fruit concoctions and torte to tempt the most rigorous of pudding refusers. Tempted? - The Hair Gallery - Exclusive in-house hairdressing salon offers a broad range of hair cutting, styling and colouring whilst world-class manicure, pedicure and make-up services are also available. - Hazina - the Serena Treasure Trove - ”Hazina” means treasure in Kiswahili and our gift shop offers a treasure trove of handicrafts, traditional gifts, jewellery, carvings, ethnic fashions and evocative books.